Item #0073: From palm trees that grow in the Amazon estuary in northern Brazil comes a fruit with high levels of health-promoting antioxidant anthocyanins (free-radical fighters). Free radicals are molecules with an unpaired electron that are constantly in search of molecules in our bodies to bond with, resulting in DNA damage and a cascade of deleterious reactions that can cause cancer and heart disease, illness, premature aging, and untimely death. 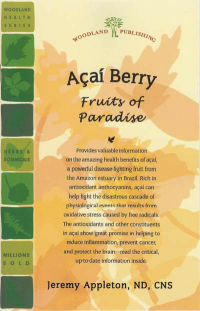 Acai's antioxidants act as search-and-destroy missiles against oxidative stress caused by free radicals. With many acai products to choose from - whole fruit, juices, concentrates, and supplements - how do we know which is the most effective? Noted nutritionist and naturopathic physician Dr. Jeremy Appleton guides us through the maze to find the right acai product in the quest for optimal health.